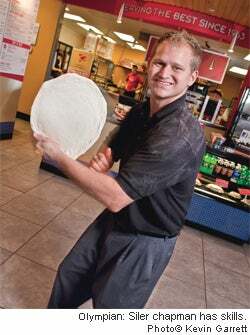 Siler Chapman picked up a ball of dough and found fame, fortune and franchising. Early in his freshman year at University of North Carolina at Charlotte, Siler Chapman got an uneasy feeling about the path he was on. "It was right after 9/11," he recalls. "People had lost their jobs and were coming back for advanced degrees. It opened my eyes. I didn't want anyone coming in and firing me. I wanted to be my own boss. I started praying and praying about what I should do." The answer came to him at 3:30 on a Monday morning, when he sat bolt upright: "This thing in my head said, ‘Open a pizza place.'" Within a year, Chapman left college and, with a loan from his grandparents and experience from working at a Pizza Works franchise, opened Si's Pizzeria in his hometown of Fort Mill, S.C. Then--proud of his dough-tossing skills--he went to New York to compete in a dough-tossing contest. He was booed off the stage. "That put the fire under me," Chapman says. He trained hard for six months and won the freestyle acrobatic title at the U.S. Pizza Championships in Los Angeles. That led to an appearance on the Ellen DeGeneres Show, a Food Network special and a spot on the World Pizza Champions dough-tossing team. And that led to--where else?--the Pizza Olympics in Italy, where Chapman and the U.S. team brought home the gold for pizza acrobatics from 2005 to 2008. All of that drove business, but Chapman was having trouble managing his three Si's locations. So when he was approached about converting to Donatos franchises, he made the switch. Two years later, he has 15 units and plans for 200 more. Why did your grandparents invest? Being 18 with no credit, I wasn't able to go to the bank for money. So I put together a 52-page plan for my grandparents. I knew they'd say no, but I wanted to go ask their friends and wanted to perfect my pitch with them. Halfway through, my grandpa stopped me and said I could have $250,000 if losing it meant I'd go back to college. He said most restaurants only last six months. That's what motivated me. How much has tossing dough helped? It really enhances sales. When I was on Ellen, it almost doubled sales. The first time I went to Italy, I saw these guys tossing three or four doughs at a time, and I thought "I can't do that." But I could ride a unicycle, and when I rode the unicycle and tossed dough, it blew everyone away. That's what I'm famous for, throwing two at a time while unicycling. Was it hard changing to a franchise? I was running around with my head cut off. I didn't have any basic structure or systems in place. I've seen hundreds of pizza concepts, but Donatos believes what I believe in: Their mission is to promote goodwill through their products and go above and beyond in service. My sales increased 33 percent when I made the switch. Are you still tossing dough? Last year, Donatos brought in a hand-tossed product, and my tossing is great marketing. Next spring, I'm going to Italy for one more title. They see me as the has-been kid, but they'll be surprised when I step back in.